Everyday Saints and Other Stories is one of the best books I have ever read. It has sold over a million copies in Russia. The author is a hieromonk, (priest/monk) in the Eastern Orthodox Church in Russia. 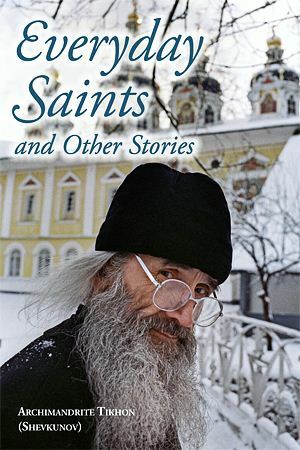 His book is a collection of stories about the remarkable people/everyday saints he has had the opportunity to meet on his monastic journey starting with his early years as a film student, his conversion and call to the monastic life in Communist Russia. His stories and encounters are remarkably candid, lovingly humorous and profoundly moving. You will not be able to put this book down and shed a few tears along with way. Archimandrite Tikhon (Shevkunov). Everyday Saints and Other Stories. Translation by Julian Henry Lowenfeld. Pokrov Publications, 2012. $23. 504 pages, illustrated. ISBN 978-0-9842848-3-2, 978-0-9842848-4-9. Next postHonorable Mention at the Paris and London Book Festivals, The Pearl of Great Price, by Veronica Hughes!